Our latest website design Kilkenny project is for Thomastown Community Network which is a new organisation in Thomastown, County Kilkenny. It represents the coming together of a broad section of interests, with the common aim of improving the quality of life for all in the locality. Thomastown Community Network was formed via of series of meetings held during Summer 2016. It plans to achieve its objectives through a combination of voluntary community projects and also liaison with statutory bodies and accessing grant aid. Members asked us to build them a website ahead of the Network’s official launch in late September 2016, to both publicise that launch meeting and to explain the aims for the months and years ahead. We were happy to oblige. We liaised with some of the driving forces behind the establishment of the Network, to identify the most important elements of their early plans, and to agree what needed to be on the new website initially. We also devised a plan for going forward after the Network launch, when the site will become much more active with news and details of upcoming events, as well as serving as a directory for local businesses, attractions, activities and more. This was one of our ‘express’ projects as time was of the essence in getting the new site live well in advance of the official launch meeting. Basic information was supplied by Network members and we re-wrote and extended this, to optimise it for layout purposes and online use. 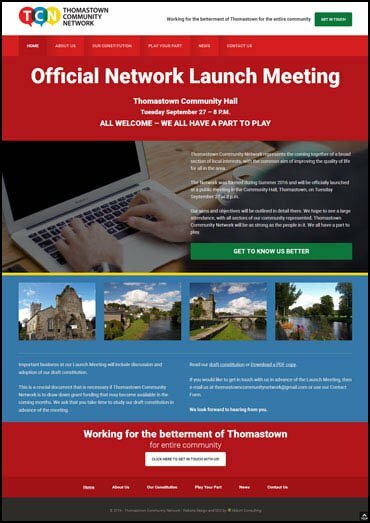 We sourced a number of attractive images of Thomastown, and we chose a streamlined design to best present the basic information and an obvious ‘Call To Action’ – for local people to attend the official launch meeting. The website was also built in such a way to allow it to be easily expanded as time goes on and Thomastown Community Network becomes more active.